In the future, many of the issues that present humanity with complex problems today, such as disease and hereditary conditions that lessen the quality and length of life, may actually become nonexistent. This will likely be become a reality thanks to the presence of emergent nanotechnology that will supplement and, eventually, redefine the way our immune systems work. This notion becomes slightly more than a lingering possibility, however, thanks to discoveries like this one: a team of researchers have now identified a series of peculiar strand like “nano-wires” within the Geobacter sulfurreducens bacterium which, amazingly, seem to be capable of conducting electricity almost like conventional copper wiring. Incredible though this may sound, the implications here for humanity’s future may be as far-reaching as the cosmos themselves. 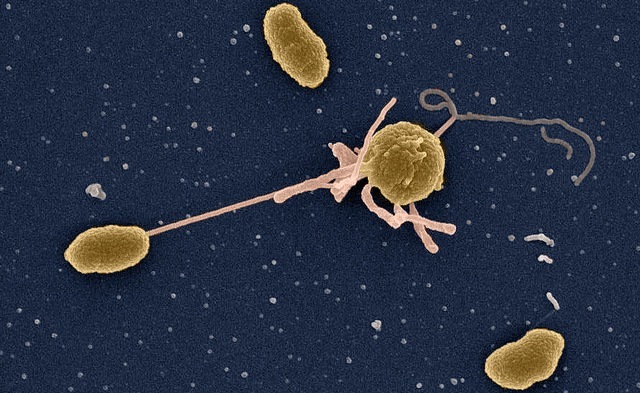 Writing for TGDaily, Kate Taylor recently blogged that the bacterial filaments, likened to being literal microbial nanowires, “can move charges as efficiently as synthetic organic metallic nanostructures,” and over distances exceeding the bacterium’s own length up to several thousands of times. Derek Lovley, a microbiologist overseeing the project, called this, “a paradigm shift in biology,” presenting new possibilities for combating such things as environmental and renewable energy concerns. But these sorts of discoveries may not just hold potential for changing lives by virtue of their applications outside the human body. Indeed, if nano-technological innovations of the future do begin to incorporate things like artificial intelligence, self-replication, and ultimately assimilation with the human species itself, we may very well already be looking at biology today that presents new possibilities for tomorrow’s digital and cybernetic technologies. In fact, the possibilities may extend even further than Earth itself: many futuristic interpretations of physical space travel and colonization involve the presence of eventual nanorobotic drones or “scouts”, capable of populating regions of space and relay information to humans who may never be able to (or in this case, even need to) physically travel there. But perhaps most interesting of all is the notion that biological organisms may, as a byproduct of eventual assimilation with nanotechnology, also could begin to change in terms of their fundamental design. Genetic modifications could eventually render even physical bodies like ours (which, by this time, may be only “semi-physical” by our standards today) capable of enduring the rigors of travel through space, and even to distant planets. But should such innovations indeed ever occur, where do these sorts of changes leave us as a species? Are humans still humans, once they reach a point where the fundamental makeup of their bodies–and thus potentially their very minds and consciousness–are integrated with advanced robotic and cybernetic systems? If not just our physical attributes, but our mental processes and even the intangibility that is human consciousness ever became digitized, the ability to perceive things like “space” and “time” as we see them today could change in drastic ways… in fact, since experiments pertaining to Einstein’s theories of Relativity already show that time is a perceptual illusion, perhaps a future mechanized version of today’s humans would be capable of perceiving time similar to how we perceive space today: as a tangible field or environment through which one can move and interact. This leaves us with some troubling questions: for instance, if future humans could perceive (or even manipulate) time like you or I are able to interact with space, then could future humans indeed be capable of what our science fiction films of today would call time travel? How might we perceive such beings, should they interact with us in a state we might perceive as the present day? In fact, is it likely that we would we be capable of perceiving them at all? Indeed, the implications here leave a number of startling possibilities, pertaining to a wide array of subjects ranging from UFOs and aliens to multiple dimensions. Perhaps the windows to a radical new world of tomorrow exist already… within some of Earth’s tiniest and most unassuming life forms present among us here and now. Image by Anthony D’Onfrio via Flickr.